This widespread and problematic invasive (Berberis thunbergii) was found at 2:30 pm Saturday, in an area of Morris Park that had not been previously associated with this plant. Complicating the situation was the fact that there were still seed-bearing berries on the stem. At any moment these berries could have been released into the wild, further propagating the species and infesting forests in the region. Each berry was potentially a moment away from a hungry bird eating it and depositing the seeds in a new location where they could form an infestation, crowding out native understory plants, and threatening the very ecosystem that sustains the bird’s longterm survival. Containment commenced immediately. Plastic bags were pressed into service, and all parts of the plants containing berries were enclosed and removed from the site. 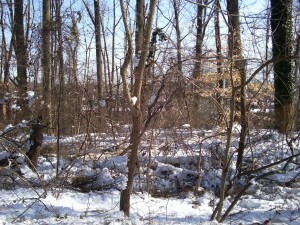 Parts of the specimen without seeds were saved for further study, being that this plant is not a common invasive in this area of Morris Park . An assessment of the immediate area was the logical next step, and sure enough, several other specimens of Japanese Barberry were found and contained within the next hour. The Japanese Barberry was found during a routine management exercise of another widespread invasive shrub Burning Bush (Euonymous alatus) . What started out as an uneventful, rainy afternoon, controlling a known problematic invasive ended up with a startling but not altogether unexpected finding. While not a widespread invasive in Morris Park, Japanese Barberry is considered a widespread invasive by the New Jersey Emerging Invasive Strike Team. This organization has classified the priority of concern of this plant as a lower priority than removing exotic species that have the potential of becoming widespread. This is a theme that penetrates the field of environmental restoration, from Oregon to England as far as we know: When addressing environmental concerns, we must choose our battles, as resources permit; first we fight the battles we have the best chance of winning. The highest priority is to protect the most untouched and un-intruded natural areas. The intervention and restoration of infested and degraded areas follows, in order of our chances of success. 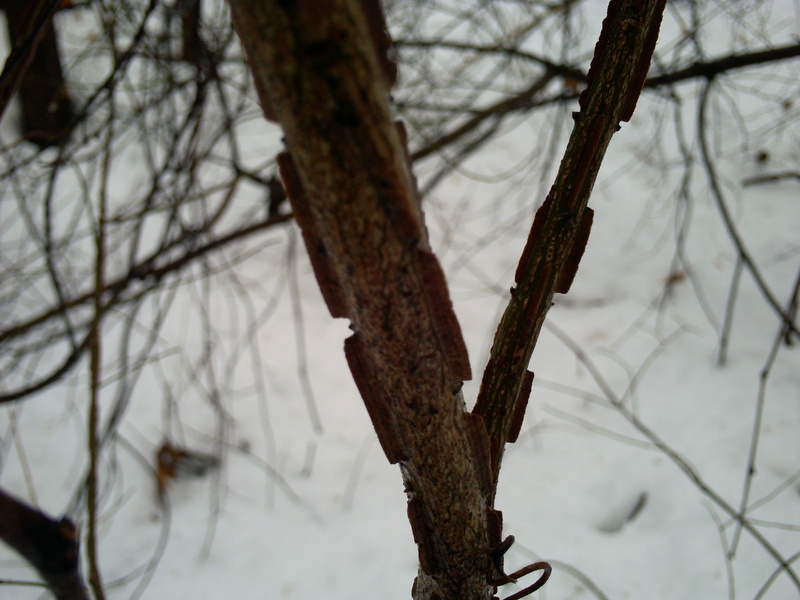 The Eunymous alatus has become a widespread invasive in our area of concern in Morris Park. Note the corky wings along the stems. 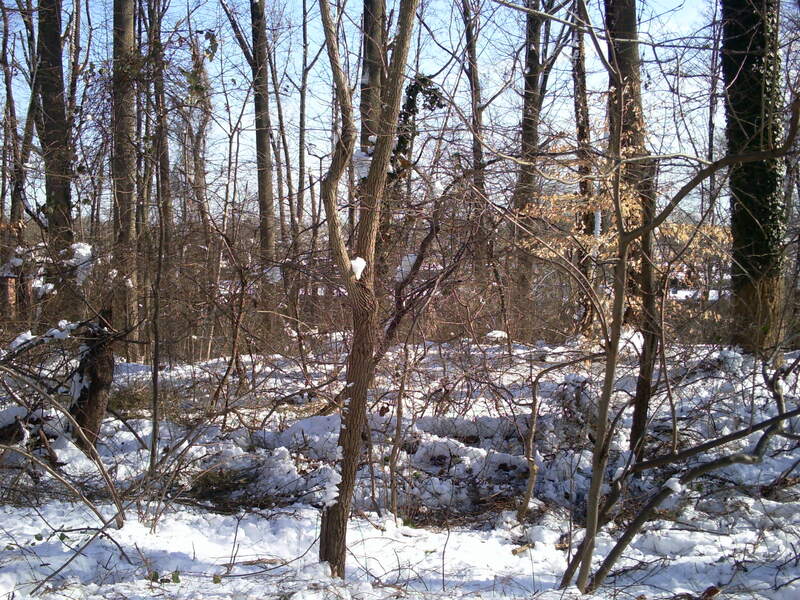 We have been removing this understory bush for three years. Tulip Poplar (Liriodendron tulipifera) is a tall and majestic tree with beautiful green and orange tulip- like flowers that is best enjoyed a safe distance from any property. This fast-growing native tree has the best chance of rebuilding the forest canopy in now blighted sections of Morris Park. We were surprised to see a specimen at the Mt Cuba Center that was at least 25 feet tall and had a decent girth, that was planted only 12 years ago. 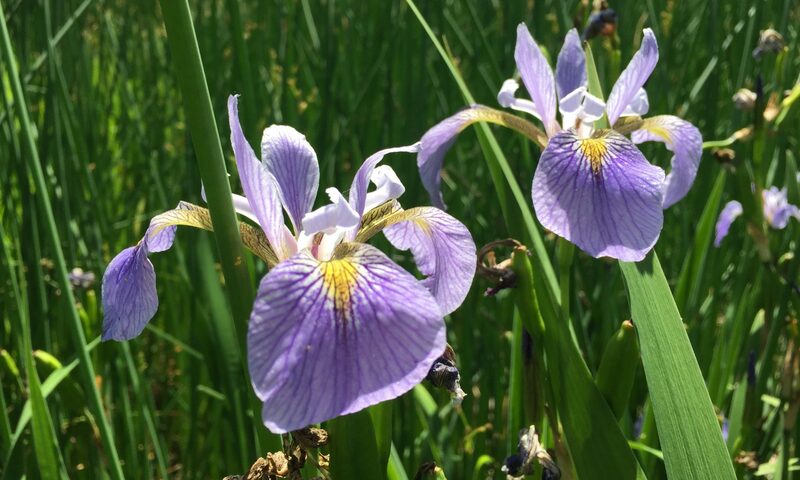 It was planted after an older tree had fallen, opening up a hole in the canopy that would have created a problematic situation for their piedmont woodland garden. 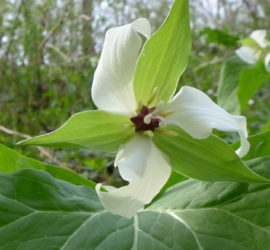 The Tulip poplar, a pioneer species in forest regeneration, provided the shade and dappled light needed by woodland beauties such as bluebells (Mertensia virginiana) and the many species of Trillium represented at Mt Cuba Center. In Morris Park , we have no need to plant Tulip Poplar in the canopy holes. All we do is remove the invasives, and one will start growing on its own. In fact we have to weed them out of our garden all the time. The best ones we transplant deeper in the park in blighted areas, so they get an early start, before we have the chance to remove the invasives. Some of the finest Tulip Poplar specimens we have ever seen can be found in the Wissahickon Valley gorge, a section Of Fairmount Park right here in Philadelphia. These trees are gigantic, with very wide and straight trunks, towering into the forest. Just walk along the Forbidden Drive and look up the hill, on the west side of the road, all along the route and they can be seen, often growing in the small ravines that spill into the Wissahickon. Here we have only touched upon the many redeeming qualities of the Tulip Poplar, and there is much more to expound upon concerning its place in the forest and its attributes that make for a great and magnificent forest tree. However, it does have a bit of a habit that can be troublesome if one is located too close to something that is best not crushed on a yearly basis. The wood is soft and and the branches easily dismount and will careen towards your most valued objects if they are near the tree. The branch will make a loud cracking sound first, giving a warning to all that will heed the call. Weather is not always the only thing that will make it fall. A bit of rot on one part of the branch can make it fall anytime. A word of warning: Listening to ones I-pod while in the forest is not recommended. The forest is the kind of place where all of ones senses should be alert, especially in the city. Not long ago a young woman was found dead in the Wissahickon, with a large tree branch on top of her. Her i-pod was still playing music when they found her. We often wonder if she could’ve reacted more appropriately if she was able to hear the branch cracking, before it crashed down. Also, climbing a Tulip Poplar is not recommended. Here the saying “going out on a limb” most applies. Here it is, a little Dogwood (Cornus florida) sapling that was split in half from the pummeling missile that violently plunged down in its exact direction. See how low in the trunk it was hit? This could seriously compromise the tree’s chance of survival. We planted this tree from the funds provided our block by the Philadelphia Department of Street’s Philadelphia More Beautiful Committee. By entering the block in the yearly most beautiful block contest, we were awarded a small amount of money to beautify the block, which is how this tree was purchased. It was planted at the very terminus of the block, which ends at the park, in an area we call the horseshoe (because of the the two paths on each side of the street, which curve together to meet at the top of a small hill). The vision was that someday there would be this elegant native tree, that in the spring would provide a beautiful display of flowers framed at the end of the block, for all to see. The spot where it was planted was previously covered with the invasive exotic saplings of Norway maple (Acer platanoides), the exotic invasive groundcover English Ivy (Hedera helix), Garlic Mustard (Alliaria petiolata) an herbaceous invasive exotic and Lesser Celandine (Ranunculus ficaria). Also in this spot was dumped material, with at least 700 pounds of concrete rubble, old bricks, potato chip bags dating back to the 70s, bottles, electrical wire, car parts etc. The good news is that half of the tree is still alive! Hopefully by may of 2030, there will be a halfway decent dogwood tree with some nice blooms on it. We had originally planted two of them, but one suddenly died without prior notice, possibly from the dogwood anthracnose disease, a blight affecting these beautiful native trees. 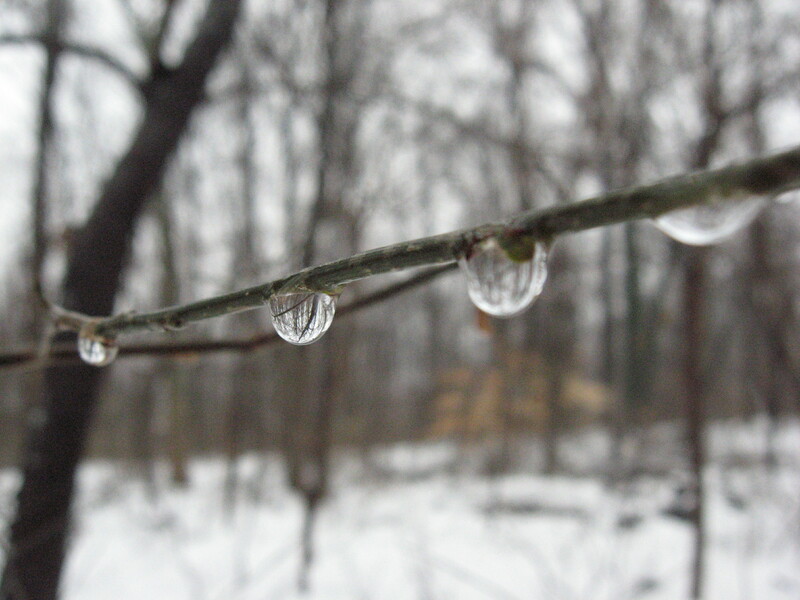 The Groundhog Day storm was alot of ice pelting down for about an hour or so early this morning, resulting in the branch that fell, some freezing rain and then just rain later on. 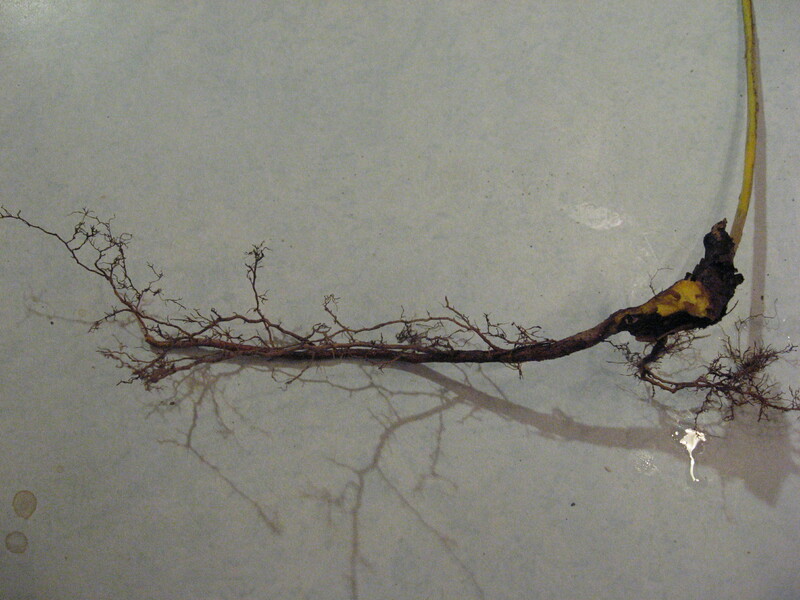 Off in the park, a Sassafrass branch (Sassafrass albidum) came down from a mature specimen. Why does the Tulip Poplar break so easily? What is the evolutionary advantage of this? Perhaps, because the tree is so tall (The tallest in the canopy in these parts) it needs to stay tall and compete. What use is an old lower branch that is not getting that much sun and using up needed resources? If they break off easily after serving their usefulness, the tree will be better served, able to redirect those resources to growing ever taller branches, outcompeting other trees. The blackened area at the very tip is not rot, but dirt. 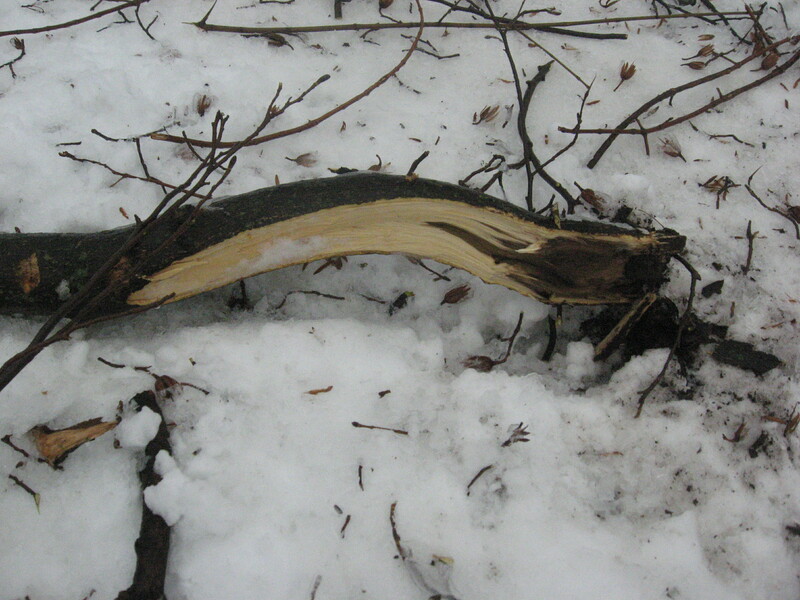 The branch went into the ground like a spear before rebounding to its present location. 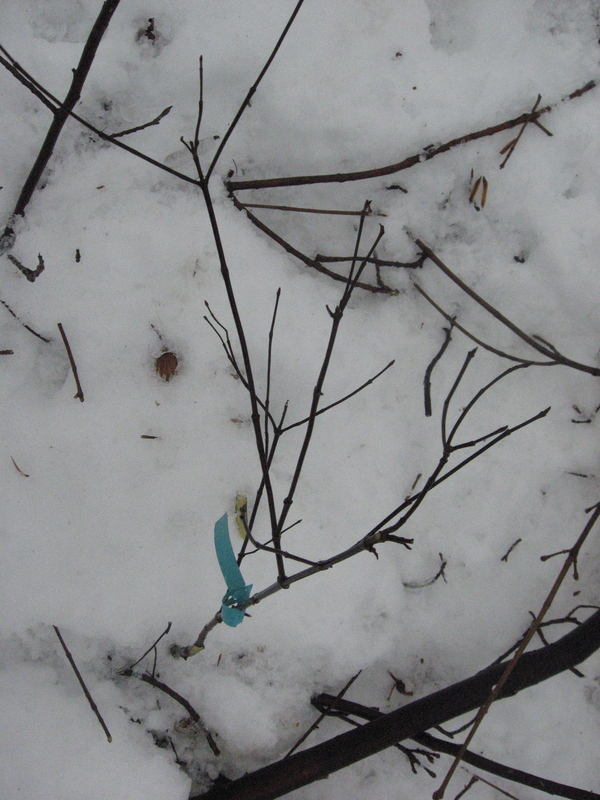 Now is a great time to get outside and tromp through the deep snow and remove Multi-flora Rose. The snow is starting to lose its charm. 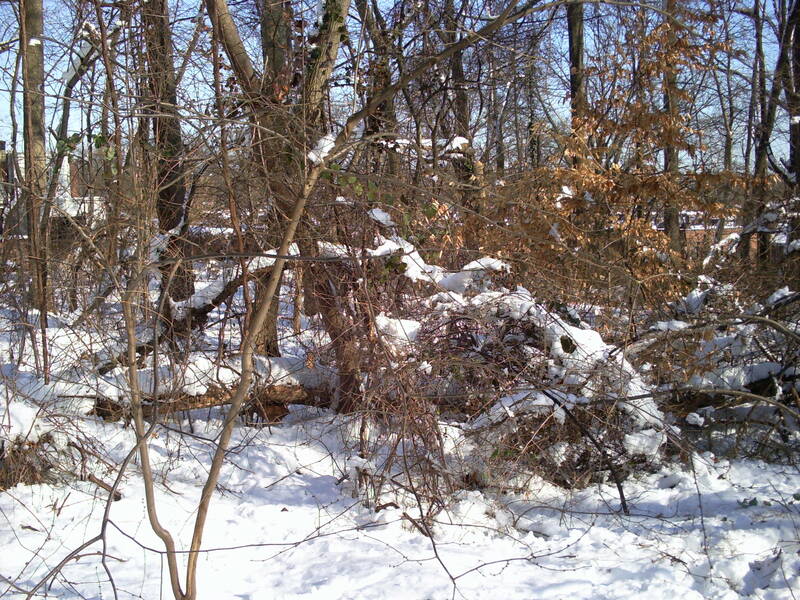 We have been finding more and more native trees and shrubs in Morris Park that have broken and split under the weight of the snow. Its an ongoing inventory of destruction. A whole plant splits at the trunk. What to do? Prune it? Do nothing is the conclusion and here is why: The bark remains intact, and there is a whole network of buds ready to go to leaf and photosynthesize in the coming season. Even with the split trunk, the plant will still go to leaf and subsist. The energy created by this process will help the plant rebuild its structure. Once this process has been established and new growth commences as the season progresses, the plant will abandon the damaged section, which will die and rot off eventually. We examined many spicebushes (Lindera benzoin) today and could read the history of each plant by looking at the branches. Every specimen tells its own story, and when analyzed as a group, simple conclusions can be ascertained: Branches of this shrub are being split every winter. These branches continue to live, but only for one season. They then die, and turn red. The plant sends up robust new shoots. Eventually the dead branch falls off, and the trunk heals the scar. Sometimes the plant does just die. Most of the time it continues to live, regrowing what has been lost. 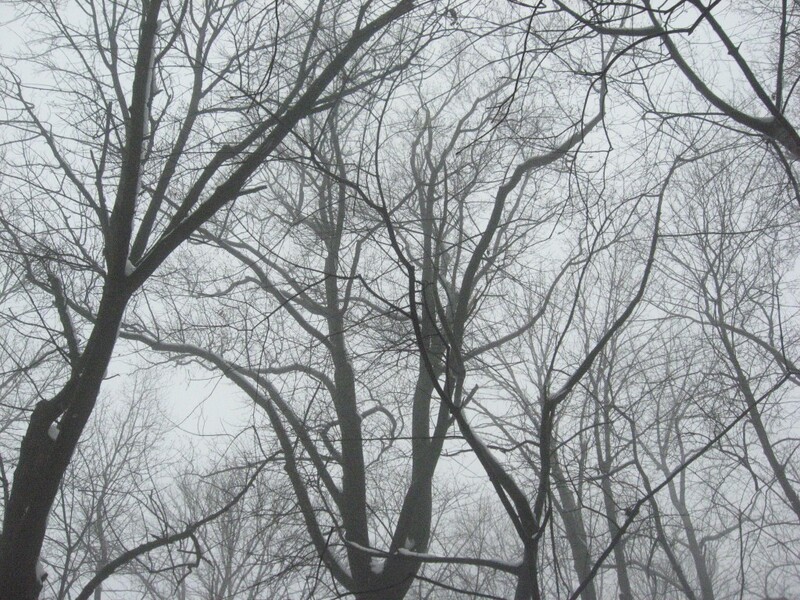 Winter is a great time for this study and reflection of the bones of the trees and shrubs. 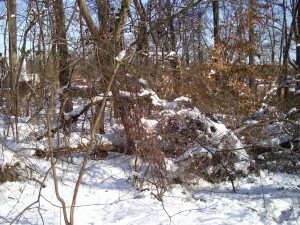 Multiflora Rose, a difficult exotic invasive, has created impenetrable thickets throughout Morris Park, crowding out native plants, and reducing the productivity of the natural ecosystem. This plant has sharp thorns that easily penetrate clothing, making it difficult to remove. 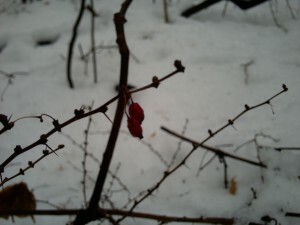 However, in the winter, this plant is dormant and more easily accessed. 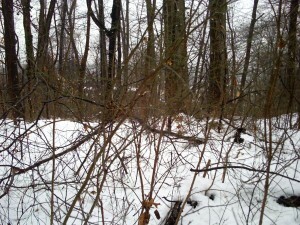 With thick winter clothing and work gloves, we are able to move right into the thickets and cut down the descending canes enough to access the ascending sections of this arcing menace. 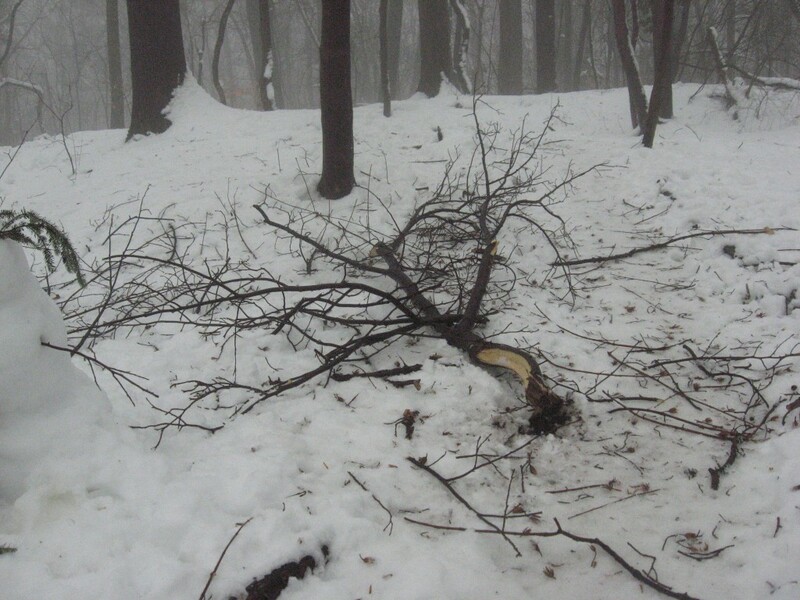 We leave the rooted stub in place until the snow melts and the soil is wet and friable, so we can easily pull out the entire plant for disposal. Removal of the roots is essential for the effective control of this plant. The roots are considered propagules, which are any part of a plant that can reproduce into a new plant. 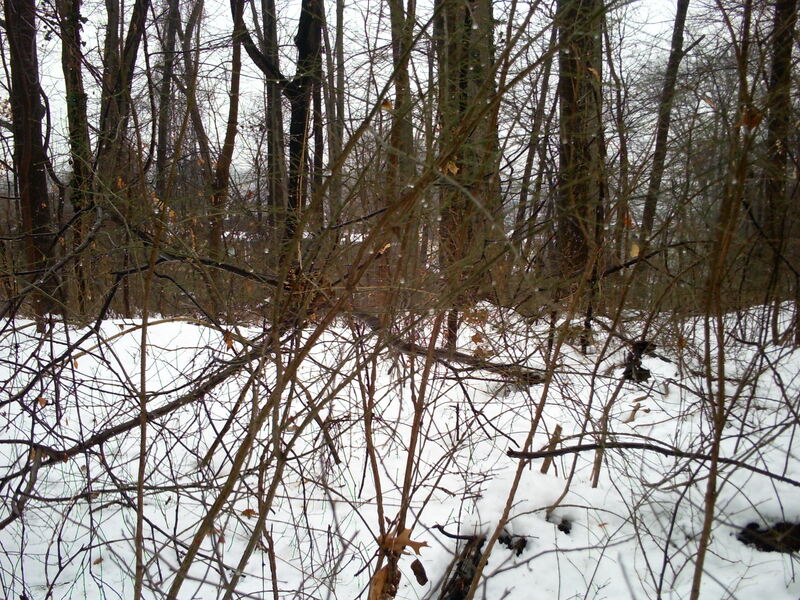 In the immediate foreground is a spicebush that was covered with invasive vines last May, until we removed them. It survived this snow event very well. However, much of its bark was rubbed off by deer rubbing their antlers, called “buck rub” and now the bush is at risk of death. 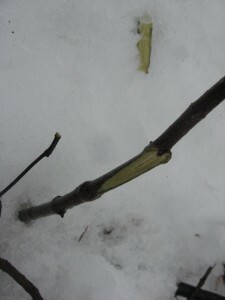 The arched figure in the back-round is a Black Cherry pulled down by a mass of grape vines and the weight of the snow. Today we removed all of the vines threatening this tree, which began to perk up, rising from its prone state. The snow is so deep that it is hard to move, so we had to stay in one spot while we worked. We still were able to begin the abatement of a thicket of Multiflora Rose (Rosa multiflora), and a stand of Burning Bush (Euonynmus alatus). Our feet were cold at the end of the afternoon, but we were able to be outside for the duration of this winter day.